Site of a two story brick building built for Robert H. Vance of San Francisco in 1853. One of five brick structures erected that year, it was first occupied as a store. Almost coincident with the founding of Camp Union in 1861, it was taken over by Martin Arenz for a brewery and operated until after 1880. 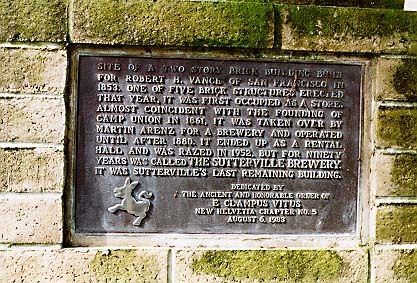 It ended up as a rental hall and was razed in 1952, but for ninety years was called 'The Sutterville Brewery'. It was Sutterville's last remaining building. Sutterville Rd, vicinity of Land Park Dr, Sacramento.